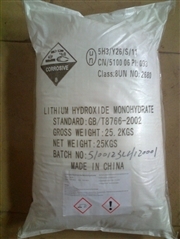 Lithium Hydroxide-Brichem (Haikou) Co. Ltd.
Properties: white quadratic crystal with pungent taste and strong alkalinity, easy to absorb carbon dioxide and moisture exposed to the air, soluble in water but slightly soluble in alcohol. Density: 2.41g/cm3; melting point: 471℃; boiling point: 925℃ (decomposes). Packing: 25kg woven bag with double plastic inner bags. Applications: mainly used as an important additive to lithium ion grease, alkalinity battery and anti-corrosion zinc ion colorants or as a carbon dioxide sorbent.